Granted in 1735 by Governor Jonathan Belcher of Massachusetts, this town was the site of Fort Number 1, first in the line of forts bordering the Connecticut River. 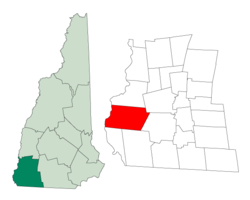 After the border between Massachusetts and New Hampshire was fixed, the town was incorporated on 11 February 1752 by Governor Benning Wentworth as Chesterfield, named for Philip Stanhope, 4th Earl of Chesterfield. The first settlers were Moses Smith and William Thomas, who, with their families, came up the Connecticut in canoes, in the fall of 1761. Their chief subsistence through the winter and spring of their first year in the wilderness consisted of salmon and shad, of which there was a great abundance in the river, and deer, which were numerous in the forests. The town contains some of the finest farmland in Cheshire County, yet once was home to small manufacturing, notably spinning wheel parts and handtools. In 1772, Philip Embury conducted the first Methodist religious services in New Hampshire at the James Robertson farm in Chesterfield, and in 1803, Francis Asbury preached here. Asbury Church is listed on the National Register of Historic Places and is recognized for its historic puritan design. Asbury Church is considered the "Mother Church of Methodism" in New Hampshire, and is the oldest Methodist church in New Hampshire. The town has had continual Methodist Sunday services for over 225 years. Chesterfield Academy, established in 1794, was for decades one of the most celebrated in the state. Spofford Lake is one of the region's largest and oldest resorts. According to the United States Census Bureau, the town has a total area of 47.6 square miles (123 km2), of which 45.6 sq mi (118 km2) is land and 2.0 sq mi (5.2 km2) (4.21%) is water. Chesterfield is bounded on the west by the Connecticut River. The highest point in the town is near its southern border, atop Davis Hill, at 1,427 feet (435 m) above sea level. Chesterfield lies fully within the Connecticut River watershed. The town is served by state routes 9 and 63. As of the census of 2000, there were 3,542 people, 1,366 households, and 1,005 families residing in the town. The population density was 77.7 people per square mile (30.0/km²). There were 1,632 housing units at an average density of 35.8 per square mile (13.8/km²). The racial makeup of the town was 97.80% White, 0.23% African American, 0.56% Native American, 0.17% Asian, 0.08% from other races, and 1.16% from two or more races. Hispanic or Latino of any race were 0.56% of the population. There were 1,366 households out of which 32.7% had children under the age of 18 living with them, 63.5% were married couples living together, 6.9% had a female householder with no husband present, and 26.4% were non-families. 20.4% of all households were made up of individuals and 6.6% had someone living alone who was 65 years of age or older. The average household size was 2.59 and the average family size was 3.01. In the town, the population was spread out with 25.9% under the age of 18, 4.9% from 18 to 24, 27.9% from 25 to 44, 30.4% from 45 to 64, and 10.9% who were 65 years of age or older. The median age was 40 years. For every 100 females, there were 103.8 males. For every 100 females age 18 and over, there were 100.2 males. The median income for a household in the town was $51,351, and the median income for a family was $58,516. Males had a median income of $44,087 versus $26,547 for females. The per capita income for the town was $25,051. About 4.9% of families and 4.5% of the population were below the poverty line, including 4.5% of those under age 18 and 6.4% of those age 65 or over. ^ Coolidge, Austin J.; John B. Mansfield (1859). A History and Description of New England. Boston, Massachusetts. pp. 444–445. https://books.google.com/books?id=OcoMAAAAYAAJ&lpg=PA9&dq=coolidge%20mansfield%20history%20description%20new%20england%201859&pg=PA444#v=onepage&q&f=false. ^ "Annual Estimates of the Resident Population: April 1, 2010 to July 1, 2017 (PEPANNRES): Minor Civil Divisions – New Hampshire". https://factfinder.census.gov/bkmk/table/1.0/en/PEP/2017/PEPANNRES/0400000US33.06100. Retrieved November 14, 2018. ^ "Census of Population and Housing". Census.gov. Archived from the original on May 12, 2015. https://www.webcitation.org/6YSasqtfX?url=http://www.census.gov/prod/www/decennial.html. Retrieved June 4, 2016. This page uses content from the English language Wikipedia. The original content was at Chesterfield, New Hampshire. The list of authors can be seen in the page history. As with this Familypedia wiki, the content of Wikipedia is available under the Creative Commons License.